There’s a big contrast in reactions to the decisions of two grand juries not to indict police officers involved in the killing of two unarmed civilians, both black men. In the case of Michael Brown, shot multiple times in Ferguson, Mo., political divisions have influenced opinions over whether police officer Darren Wilson should be prosecuted, and polls indicate that Republicans are more likely to believe Wilson’s version of events. In the case of Eric Garner, choked to death on Staten Island, people from across the political spectrum are shocked at the waving away of police brutality by the grand jury. 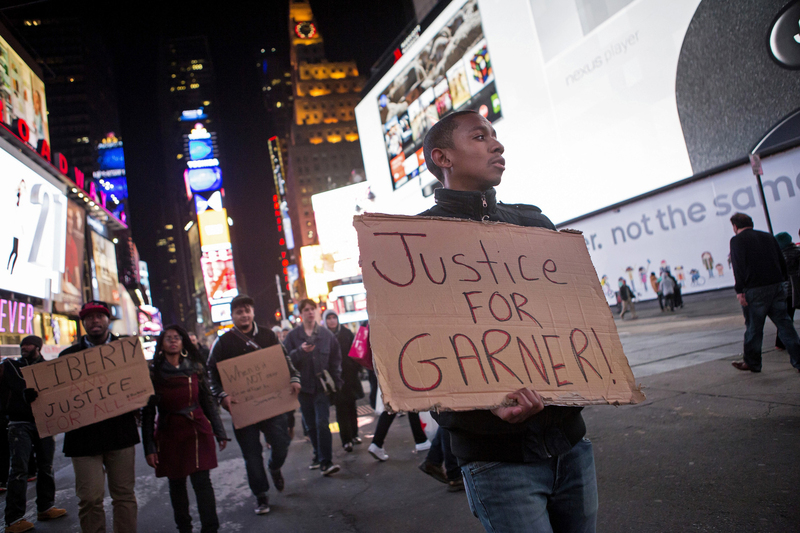 The Garner case is much simpler to explain and easier to address. You can try to contain it in a discussion of police tactics, whereas the Brown case leads to all kinds of questions about race and inequality in America. Geography always counts. Look at the where the two cases took place. New York is a large, prosperous city with a relatively healthy job market. It has low crime rates that have only dropped further since Mayor Bill de Blasio suspended the police department’s “stop and frisk” practice that targeted young black men. Racial segregation may persist in housing and in social circles, but New York is an outlier in that most residents interact with people of different color on a daily basis. No one wants to see the police choking anyone to death anywhere near his or her neighborhood. Reforming the police department to prevent deaths like that of Eric Garner carries little risk of a backlash among voters in the city. Ferguson, Missouri, is a small, depressed city whose boundaries reinforce economic and racial segregation from wealthier suburbs. It has a weak property tax base (now weakened further by rioting and property destruction), and so it depends on revenue from traffic fines and court fees for minor offenses. This encourages the police, almost all white in a city that is 67 percent black, to be aggressive in stopping and interrogating residents. Ferguson is not a commercial hub or tourist destination, and people drive around it whenever possible. Changes to police training aren’t going erase tensions between the police and residents, and more comprehensive reforms (such as state aid to lessen the dependence on fines and reduce the inequality of government services among towns) face a hostile state electorate. Partly because New York is America’s media capital, we may be getting more coverage and follow-up about the Eric Garner case. The Garner case may also be an opportunity to narrow the focus on police training as opposed to the more pervasive and intractable sources of racism and economic segregation in Ferguson. This is understandable in that it’s tempting to tackle to problem that seems to have an easy solution first. There is certainly more consensus on the Garner case, so it makes political sense to move it to the front of the line in addressing police brutality. Ferguson, however, should not fade into the background. "Ferguson, however, should not fade into the background." The economic and social woes that residents suffer should remain our concern, but the case should fade: the forensic evidence and the most detailed and consistent eye witness accounts support the police officer's account. We must face this fact. It is a not a good case by which to challenge the injustices of our criminal justice system. There are many, many better ones (including the Garner killing). I would hope that the residents of Ferguson would register to vote and then elect a city council and mayor that more accurately represents them. Isn't this the way to get to a police department whose staffing reflects the racial makeup of the community they (hopefully) serve? In order to address any issue it is first necessary to understand the facts involved. Your assertion that Eric Garner was "choked to death" is false. Surely you should have investigated the case yourself before writing about it and making such a serious charge. First of all, EMTs were called and took Garner away. When a bystander asked one of the cops why no one was performing CPR he allegedly answered "Because he's breathing." Garner died some time after he was subdued and in cuffs. He was assuredly not choked to death; he did not die of asphyxiation. The medical examiner found no damage to the windpipe or neck bones. What he did find were contributing factors such as "acute and chronic bronchial asthma, obesity and heart disease." Garner's case was a tragedy, the situation surrounding it is bad, and your article will only make things worse. The commonality in these two cases lies in the issue of institutional injustice in the United States. While institutional racism may exist today in the United States, the issue with these two cases lies in the failure of police force procedures. Police brutality is one of the leading contributors to the institutional racism that exists in the United States and, thus, must be resolved first in order to alleviate the greater issues it causes. Sullivan is spot on when he says that the main difference between these two cases is the existence of video evidence. The ability to corroborate evidence as seen in a video is what is lacking in the current US justice system. A majority of people can agree upon the use of excessive force upon seeing the footage of Eric Garner but it is a toss up when it comes to the Michael Brown case, because no one can see for themselves what happened. Therefore, in order to move to a more objective moral and just code the US must institute policy to have mandatory camera rigs on all officers. The best way to arrive at a just conclusion is to have all of the evidence presented and, in a world where facts can be distorted by constant media processing, the presence of video evidence is key. If all officers are required to wear a camera there will also be added officer and civilian discretion as both parties will be aware of the fact that their actions will be captured on camera. Implementing such procedure would effectively reduce crime and increase certainty of convictions. Additionally, it would act to decrease institutional racism caused by police brutality as officer conduct will be entirely captured, recorded and subjected to judgement by proper authorities. There is racism in this country. Of that there can be no doubt. However, what is it in our human nature that makes us want so much to find the blame for the results of racism in someone else? It is called scapegoating. In the present case it is much easier to blame the police than it is to admit that we might have some complicity in the problems that face this nation with regard to race. It is much easier to blame the police, than to admit that programs we have supported have contributed to the problem, rather than solving it. We are the good white folks - it is those nasty racist police who have to be reformed. Meanwhile, we support and accept as truth the inflammatory and inaccurate reporting of a media institution which makes huge profits out of selling its product. Meanwhile, we accept the testimony, no matter how many times it changes to fit the circumstances, of an accomplice of the man shot, and refuse to accept testimony which fits the physical evidence. Why? Because for there to be real change, we would have to change. It is much easier to blame the cops. Are there bad cops? Of course. Are there whole police departments that are bad? There are; I can think of a few about which I have personal knowledge. However, I would warrant, again from personal experience of knowing many Law Enforcement Officers, that the average LEO goes to work each day with the sincere desire to do that which he or she has sworn to do - to protect and serve. (Do not think for a minute that they are not risking their lives to do so.) Is there such a thing as institutional racism? Of course. Again, to change that, we would have to make hard choices; we would have to change. It is much easier to blame the system, than to admit that we are the system. We indeed have very short and selective memories. A very few bad priests abused children and a few bishops turned either a blind eye or an ignorant eye to their actions. Yet, even today, after the Roman Catholic Church has taken strong measures to make amends and to correct the institutional problems that allowed these predators to thrive, there are many people in this country who associate priests with pedophiles. That same sensationalist media that cast aspersions on the many, many fine priests who have given their lives to God and the people, is the media which so informs our opinions about the police. Chew on that a bit. I was absolutely sickened after viewing the video of Eric Garner being put in the choke hold by the NYPD officer, I couldn’t even look at the screen. Race is indeed an underlying issue, but it is only a part of the bigger picture that is Police Brutality. Time and time again everybody jumps to race to always be considered the main focus of these types of tragedies. Police Brutality has gotten too common in the U.S to a point where I feel as if I’m watching a new video of it or hearing a new story on CNN about. This excessive use of force by police officers is not a new thing to our nation, Rodney King was beaten senseless by a couple of LAPD officers after a car chase. These officers were acquitted just as the officer in the Eric Garner case and Darren Wilson were. I mean literally just about a week ago there was a 12 year old black kid shot for having a toy bb gun in his hand. Every single one of these victims were black. I could not agree more for the argument for Police Officers to wear body cameras while on-duty, but how much will that really help? Both Rodney King’s and Eric Garner’s beatings were caught on camera, yet neither of their attackers were found guilty or punished? If Darren Wilson were to be wearing a camera would he have even been brought up on charges? It gives me no hope that I know there will be more instances like these tragedies in the future and that is truly depressing. With this obviously being a sensitive topic of discussion, it is very hard to determine whether both of these acts are because of racism. We have to remember in the Ferguson situation that Brown did rob a store previously and refused to cooperate with the police. So the police had the right to try and stabilize the situation. But I do believe that shooting him was the right decision. I was not there but with all of the resources that they had, there must have been another way to stabilize the situation. In New York, you can make the argument of racism because Garner said repeatedly that he could not breath and the cop did not do anything besides continue to choke him. I agree with the writer of the article- I do not think that Garner was a case where Race provoked the usage of violent force. Yes it was completely unnecessary and led to the death of someone, but New York has so many diversity that it is hard to be racist. Ferguson is a predominantly black town, so there might be some racial profiling, but Eric Garner case was just a very unfortunate case of police brutality.On the other hand, Ferguson case might be a more compelling argument that says racism played a part in the death of Michael Brown. However, the Grand Jury said Wilson is innocent, so people have to stand down and follow the verdict. These two deaths are very unfortunate events, but to label both as being results of racial profiling would be slightly taking things too far.